She is the Bavarian State Opera`s mezzo of choice and is achieving great success not only in central Europe – Angela Brower. Watching her on stage reveals – this young lady has it all: considerable flexibility, immense power, strong emotions, captivating stage presence, vocal as well as physical beauty, … Brower was raised in Arizona and studied at Arizona State University and Indiana University. Her career started at the Glimmerglass Opera Young American Artists Program in 2008. After that, she joined the Bavarian State Opera`s Opera Studio and then became a member of the Ensemble for 6 years. She has sung main roles of her “Fach” such as both Annio and Sesto in “La Clemenza di Tito”, Der Komponist in “Ariadne auf Naxos”, Angelina in “La Cenerentola” as well as Hänsel in “Hänsel und Gretel”, Charlotte in “Werther”, Octavian in “Der Rosenkavalier” and Cherubino in “Le nozze di Figaro”. 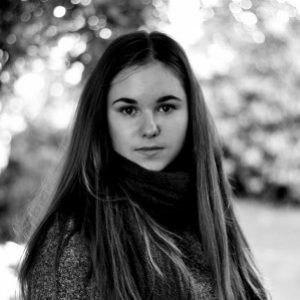 Irina Antesberger: You were born and raised in Arizona, US, you were studying there as well as at Indiana University – how does a young singer make her way all the way from the States to Central Europe, and Germany in particular? Angela Brower: It was actually Florian Scholz (director of Stadttheater Klagenfurt, Austria) who “found” me in New York, where I was doing the Glimmerglass American young artist program. He was holding auditions for the Bavarian State Opera (BSO) there, and I didn`t sign up for the audition, since I still had a year of school left and I didn`t want to leave my Masters program at Indiana University. So, everybody had been auditioning all day and in the evening, there was a rehearsal of “Giulio Cesare in Egitto” by Händel. I was covering Cesare, the main part. The singer who was supposed to do it was unable to be there, so I had to sing the rehearsal for her. By chance, Florian came to see the rehearsal. During the rehearsal, the director of the Young Artist program came up to me and said, “The two gentlemen from Munich are wondering why you didn’t audition for them today.” At the end of the rehearsal, it was decided I would have a private audition for Florian and his associate the next day. After I sang my arias, Florian responded, “I would want to offer you a position to come to Munich!”. Since the casting director, and intendant still had to hear me and agree, we sent them a DVD, to which they agreed, “Yes, we want her for our Opernstudio.” That´s how I came to Munich. I.A. :There`s a lot of discussion about the necessity of young artists programs. Which part did this kind of operatic education play in your artistic life? A.B. : It was a necessity for me – it was the perfect transition. I mean, I would not be where I am without this transition, to go from school directly to the Opernstudio. We had voice lessons, but we also had the possibility to take acting classes as well as language classes and you get to be on stage and thus gain more stage experience. And that is exactly what a young professional needs! You need these experiences for the CV, so when people see it they could say, “Oh, wow, you`ve sung at the BSO!”. This way I got other jobs at other houses, even though I stayed employed in Munich for 8 years. Through these years I gained so much experience that helped me get other jobs. Munich is the perfect place to create connections, everybody comes there – it is a central spot for artists, directors and casting directors to come and see you. I.A. : The operatic world has been changing over the past years and one of those transformations certainly is the digital culture that gradually takes over a pretty significant role, for example HD live streams, worldwide broadcasts, the social-network-activities of different companies, and so on. Opera is more accessible than ever before – for a wide public. What do you think about this development? A.B. : I do think this is really important, although there`s pros and cons. One of the pros is that more people can see it from home, via social media, youtube, online live streaming from their computers… That is what we need – more exposure! The con is that people stop going to their local opera houses anymore. For example, in Arizona, where I am from, there is an opera house. It is full of good talent, however, if people want to see the big opera stars singing on the Met stage, they may stop going to the Arizona Opera, and simply wait until there`s a Met broadcast in the cinema. That`s the problem – they stop supporting and going to their local opera houses. But, at the same time, they can be inspired by what they see happening in New York. For instance, I made my Vienna State Opera debut as Rosina (Il barbiere di Siviglia, G. Rossini) two years ago, and there was an HD online livestream. So, my family in Arizona could finally watch me in an opera! Since they live so far away, it was really wonderful for them to experience my performance online in Vienna from the comfort of their home in Arizona. I think interacting on social media is very important for an artist. I stay active on my Instagram, Twitter, and Facebook fan page. I love social media. I love interacting with people. It really inspires me to be a better artist; we all inspire each other. It is like a huge community of people! It’s a wonderful thing. I.A. : As a mezzo soprano, you often have to play boys on stage. Are there special challenges of “transforming” yourself into a different gender for the time of the performance? A.B. : To be honest – no. I mean, I grew up with five brothers, so I have a lot of boys in my life! When I actually play a boy on stage, however, I have to think about what they do; how they move, etc. In college I used to sit in a café and just watch guys – how they walked, their posture, their hand gestures,… When portraying a boy, you have to be aware of how you move, but never let it get in the way of the music. You have to be masculine within your femininity. I.A. : Among many, many other roles, your interpretations of Cherubino and Dorabella are highly appreciated . Is there a “secret” to singing Mozart? A.B. : (laughs) Appreciation. No, really, you have to appreciate Mozart and respect the style. I recently went to a performance where there were good singers but the way they were singing was, in my opinion, too “belcanto”. Mozart has to be sung very clean, just the way he composed it. You can`t go up to a high c and then “glissando” down an octave – this is not the style of Mozart. Most Mozart-roles are high because in his days the Mezzo-Fach didn`t exist; there were only sopranos. Nowadays, we call roles like Cherubino and Dorabella “Zwischenfach” roles. This means, either a soprano or a mezzo soprano could sing the role. Today, mezzos need to be versatile, in general. They have to have an incredibly wide range in order to be employed. Mozart is essential for every mezzo to sing. It helped me build a good foundation for a good technique. I learned to sing by working on Cherubino`s arias. At the beginning they are so uncomfortable, but your voice grows into it as you grow into your body, and into your technique. That is, in my opinion, healthy singing. I.A. : You most likely get offered a whole bunch of different roles – how do you decide whether to say yes or no? A.B. : It depends. For example: I was supposed to sing Zerlina in “Don Giovanni” a long time ago. The contract was cancelled, but I was so glad, because it simply didn`t fit into my voice at that time. Even though a mezzo could sing the part, it simply didn`t suit me at that very moment. You have to be wise and know where your voice is currently, and where it is going, because opera houses book you years in advance, and your voice is constantly changing; it is always growing, expanding. You have to know, “Can I still sing Dorabella in x Years, and will I be able to sing this and Octavian?” That is where you have to know yourself well, and be versatile. Also, a good teacher helps! They can help “confirm” where they think your voice is going. I.A. : Your repertoire is so wide and varied, but – is there one role that you have not sung yet that you’d love to play? A.B. : Carmen (chuckles). I love the music so much, but I don`t know if I will ever be able to sing Carmen, because most people don`t hear the rich color that this role demands in my voice. Maybe I will develop in this direction, maybe not. I would really like to, at least, give it one try. I.A. : Let`s talk about the challenge of acting – how important are gestures and facial expression – which means “visible emotions” – for you on stage? A.B. : I should ask you, the public that is watching me. We are doing a concert version of “Maria Stuarda” here (Stadttheater Klagenfurt, Austria). If we just stood there, looking at our scores, and singing without any kind of visible expression, would you be moved and inspired? Of course not! That would be terribly boring! If that were the case, the public could as well just stay home and listen to a CD in their living rooms. You have to be into the story or else – what`s the point? I.A. : How important is the language you sing in? A.B. : If you speak a language, it is so much easier for you to memorize all the words and understand everything you`re singing. For me, it is so much easier to sing in German, now that I have a good knowledge of what the words mean. I am not fluent, but I speak enough to understand it. However, in French and Italian it is very difficult, because I don´t speak or study it every day. When I restudy a role like Dorabella, for example, I first go through the score and then remember, “Ah, right, that`s what that means!” And it just comes back. But if you`re always speaking a language, it is more fresh, more alive. I.A. : Is there anything you can give young singers to take along on the way to their career? A.B. : (thinks) Know why you want to sing. You have to know why. It is a hard industry, and if you don`t know why you need to sing, then you won’t make it. It is too difficult, too competitive; you have to make too many sacrifices. However, if you know you need to sing, and share music with the world, my advice to you is: Keep working hard; be passionate about the music; continue to share your special gift with the world. The light you have within yourself – share it through the music. That is what touches people. No matter if you have a perfect technique, a perfect pronunciation, a perfect voice – if you don`t feel it, nobody is going to be moved. You have to find this light within yourself and let your voice carry that light. You have to share your heart. I.A. : Angela, you said – “Know why you`re singing!”. Why are you singing? A.B. : Well. I find singing a much easier way to communicate than speaking. I can express myself better through music than I can through my words. For me, it is the only way, to truly share my soul. With anybody. I need it. My soul needs to share the music I have within me. There`s always a story to be told and I have a story to tell, and that is best told through music.